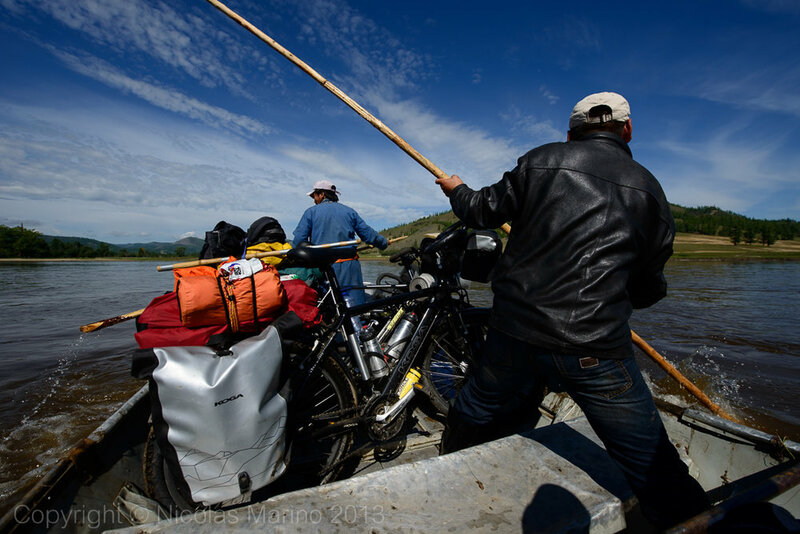 We left Erdenet with the bikes very heavy, fully loaded with provisions. We had to be prepared to spend several days without knowing where or when we would be able to stock up again because - obviously - we had chosen to follow the remote tracks instead of the main access road to the famous lake Hövsgöl. While all roads in Mongolia are remote by nature, the tracks outside the main arteries of the country are seriously remote. They are large stretches of natural beauty undisturbed by traffic, large populations and by the sounds that come with them. It is a continuum of peace and quiet beauty. That is why the main attraction of the country, is not coming to visit this or that lake or city or monument in particular. 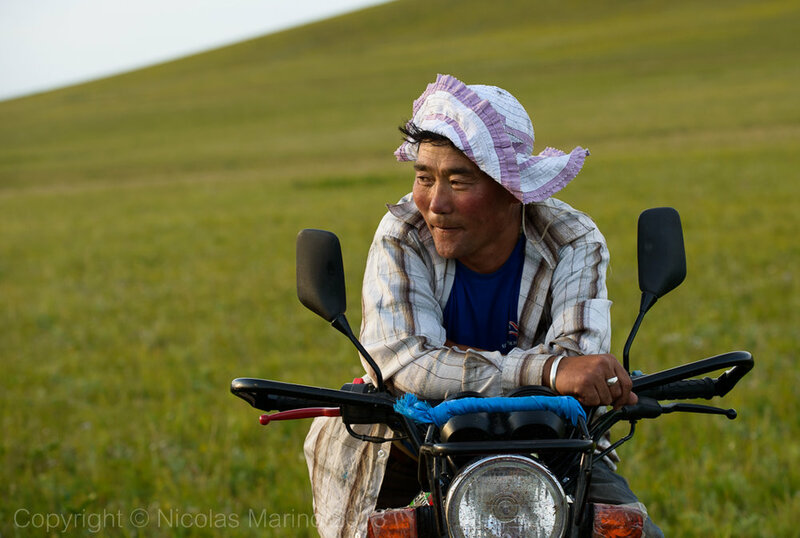 In Mongolia, more than anywhere else in the world, the attraction is the very experience of being there. Its counterpart is that when you have a problem, you really have a problem. I had one only a few days after leaving Erdenet, when the most unusual happened, the chain broke after only 800 km of use ( a good chain may last up to 25,000 km!) and because of the very reason of being new, I found myself without tools or spare parts to change it. What a damn problem! I try to solve it by hammering three spare links I had, with my Leatherman (multi-purpose tool) without success. Three friendly Mongols that pass by on their motorbikes stop and stick with me until they get me out of the jam. Between the four, we manage to hammer the links and fit them successfully (those who know about bikes, know how difficult a task this is without the right tool). Were it not for their hospitality and perseverance, I would not have known how to get out. Thanks to them we were able to continue entering in the steppe and dazzling us with their magic. Problem 1: solved. The short summer is the only time in which the Mongols have a break from the extreme cold. With it, come more pleasant temperatures but also bring heavy rains, which are responsible for making the steppe so green. Every day it rains at least once a day, they are generally short but strong rains. With the passing of the days it is easy to learn how to "read" the sky and this allows us to anticipate the moment when we would have to quickly find refuge. They are the perfect moments to find hospitality in a ger and enjoy a little more of life with the nomads. Rain brings cold but the nomads always give us shelter in their gers where they serve us hot tea and dry goat's cheese until the moment in which we can move forward. The rain is not a problem. During the nights, the word summer becomes an anecdote and summer happens to be just a way of saying. It is the end of August and in the middle of the steppe, temperatures drop to 4C. The sky clears completely; the Moon becomes an overpowering reflector lamp that erases the stars from the sky and lights up everything on earth. You don't have to use a flashlight and, if there are people around, you'd better cover yourself when going to the "toilet" (which is in nature) as if you went during day because everything can be seen. On the way to the small town of Tarialan before entering the high steppe, we met Marek, a Czech who came for a month's break from work to cycle in Mongolia. After a few hours riding together he decided that our route would be more interesting and continued his way with us. We left together Tarialan along the trail heading north and entering into a new valley, we could already see the greatness that awaited us ahead. It's just that the beauty of the steppe provides no respite. At times I could hardly believe that each new Valley would exceed the beauty of the previous one and that we would leave with that same feeling of being overwhelmed by what surrounded us. On certain points of the steppe, finding water is less easy than it seems. If there are no rivers or streams, you need to be Mongolian to know where the wells are. It was a beautiful sunset that I went out in search of water for cooking. Walking a couple of kilometers without finding a stream, I run into a group of nomads and asked them for water. They tell me they do not have any, but they won't let me go with empty hands. One of them, wearing a little Red Riding Hood hat, leaves what he is doing and offered to take me on his motorbike to the well. On the trip, he makes me live one of the most terrifying adrenaline experiences of my life. As soon as he starts the bike, speeds up to 80 km/h and starts zigzagging between the tracks of soil and grass ones on uneven ground. When I ask him to go slower and sees that I don't feel comfortable, with total confidence speeds up even further and in each zigzag, each bump on the track, I get more terrified. The more fear I feel, the more he is laughing at the whole situation and I guess he is thinking: "Oh these little fools of the city". I see that the speedometer hits the 100 km/h mark and he continues zigzagging along the bumps. The speed is such that it does not give me enough time to get scared with one bump that we're already on the next. He is having such fun with me that he even stands up on the bike, shakes it from side to side and screams in the air. We are going downhill at 120 km/h and I say to myself: “this is it, here we die, here's how it ends, it's over" and I have no way to make him to stop. I see a new bump ahead of us, it's unavoidable, it's imminent but he accelerates even more until going up the bump, when the motorbike is left floating in the air, my breathing stops, we were suspended in midair 1, 2, ... 3 ... 4 seconds I can feel the silence of the air and my heart pounding on my chest and bam! we landed I have no idea how many meters ahead. I love speed but I think I'm already going to be sick. Finally he makes a turn, makes another, and without road signs of any kind, 5 km later stops on a car tire lying in the middle of nowhere indicating the well site. I cannot swallow already because I have my heart stuck in my throat whilst my nomadic friend is literally crying out of laughter, we both can barely breath for different reason. On the way back he was more benevolent and when I dropped me off at our campsite, I can only be grateful to be alive. Meanwhile, the water was no longer a problem. Problem 3: solved. I tell the story to Julia and Marek and I need a tea to try to relax. Luckily, everything around us is pure magic, while I think I will never ever ride on a motorcycle with a Mongolian rider. Finally we began to enter the high steppe. In terms of landscape it is almost the same as the steppe, only that we are at higher altitude, about 1300 to 1500 m over the sea level on average and many parts of the hills are covered with large extensions of coniferous trees forming spectacular forests. It is there where it really begins the epic journey. In the brief summer season, Mongolia is green and is also completely defrosted. What most of the year is a path it becomes a river, and in a country where bridges are a rarity, crossing them becomes a challenge. To cross every river became a feat in itself. Some, like the Selenge river flowing from Siberia, we crossed them by boat, but finding the precise spot in the middle of the lonely forest where the rafters were, was already a feat in itself. The shallower rivers began to happen very often. They were not a problem themselves, but they involved having to constantly unload the bicycle, take one’s shoes and pants off, and make two trips through the icy river, one to carry the panniers and another with the bike on one's shoulders. Then dry, refit everything and continue but, it was not always all so easy. Sometimes we would spend plenty of time scouting to see where the depth was below the waist. Even so, sometimes the current was too strong not to drag us with it. Once or twice a day was not a drawback, but we have to cross up to 7 rivers every day, and at an average of 20 minutes by river to complete the whole process, the daily distance was reduced to 40-50 km per day in the best of cases. The rivers are extremely cold and halfway across them, our feet were completely numb already. As a man, I could feel how my testicles completely disappear in search of help when submerged. I believe that staying there long enough and I could forget to have children someday. When the depth reached above the waist but was not so much as for the presence of a boat, we would only seek local help. In this region, people always settle near the banks of the rivers, therefore, we depended on them to get across them. In those cases, the horses were always infallible, and despite all the required mobilization, the people never charged us a penny. The problem of the rivers was no longer a problem. Problem 4: solved. I had often heard about the voracity of forest mosquitoes in places like Alaska, Finland, Canada and Siberia, but could not understand how in such cold places there could be mosquitoes to begin with. The steppe was the place where I was able to see for myself that this curse is real. Mosquitoes were a problem from the start, but became particularly unbearable on the high steppe, the deeper we got into the forest. About an hour before sunset the madness began. As we road along, whole clouds of mosquitoes would emerge from the grass all around us. At times they were so many that it was maddening. With one hand I would ride the bike while I used the other to remove them off my face. The camping time was the rush hour. Squads of flying syringes threw themselves as kamikazes to any area of exposed skin. It was not just the quantity but the size of Mongolian mosquitoes that seem to be directly proportional to the size of the Mongols: giants. While at times it was a freaking maddening experience, the fact is that we had a factor in favor. At sunset, the weather was cold enough to be comfortable covered from head to toe. With a little amount of repellent on our hands and getting used to remove them from the face, we could survive to this ordeal that lasted three to four hours. By nightfall, as if by magic, they completely disappeared. During the day, the problem are some very tiny flies that stand all over the body, dozens if not hundreds stand on the clothing as if sucking up the salts of the sweat, but many others would orbit the head and float right before the eyes clouding the vision, there was simply no way to get them out, I would ward them off with one head and they'd be back instantly. We've even fallen off the bicycle for trying unsuccessfully to get them off of us. They are a plague without solution that accompanies throughout the day, especially while going along muddy roads on riverbanks. Life in the high steppe seems to occur in a state of greater tranquility, even more than in the rest of the steppe. There are less people and more sheep and horses. The gersare not longer the common housing giving way to more stable wooden cabins. Tracks go from the open steppe to the closed forest in and out, everything around seems to be a gigantic natural golf field, there are even natural sand bunkers, as if they had been planned to practice the sport. The tracks appear and disappear constantly, we ride on them when they are there and when they are not, we just ride on the soft grass. We were only 30 km from the border with Siberia and entering extensive sectors within the forest, where the sun's rays are filtered through the pine trees as if they were a die-cut paper. It is impossible to go fast, there are areas of mud, sand and many large roots sprouting from the soil. With the exception of some settlements on the banks of large rivers, we spent whole days practically without seeing anyone. 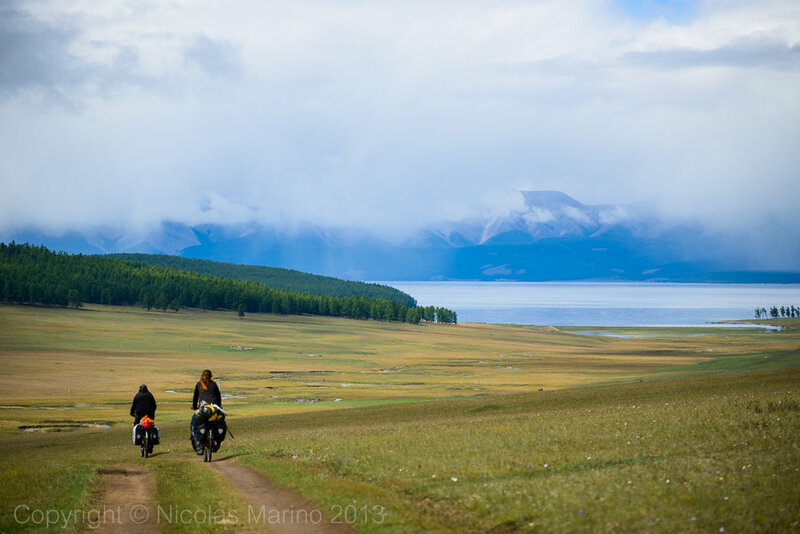 Despite the insects, the experience of riding the high steppe is magnificent. But it was right in the middle of the forest where a personal ordeal began when I was a victim of my own weakness for sweets. After a night of excess, I sparked off a process of sensitivity in a molar that in the past had had a deep cavity. The sweetness became misery and for five days and five nights I could hardly sleep, I twisted inside the tent, with a stabbing pain that I imagine similar to an electric prod in the gums. During the day I could tolerate it and cycle, but the nights were pure misery and I could barely feed myself. No painkillers were strong enough to relieve the pain. At times, the pain was so intense that I would have liked to have an ice skate to follow the solution of Tom Hanks in "Castaway". Unfortunately I had a double problem with this, I was not just in the middle of nowhere in the forest far from civilization but I was in a country where I had seen enough to believe that dentistry is practiced with pliers and hammers in the garages. I had no choice but to endure stoically and for every shooting star that saw and every eyelash that fell, wish for the pain to stop. On the sixth day I woke up with half of my face swollen as if I had been punched by Mike Tyson, but paradoxically the nerve inflammation had finally began to succumb. After the eighth day I had mostly returned to normal and by the tenth my face had almost gone back to normal. It felt like being born again and I felt more energetic than ever, all the strength and full joy suddenly got back. Since then, I keep wishing on falling stars and eyelashes fall. Already 10 days had passed since we had ventured into the odyssey of the high steppe and the arrival to the Hövsgöl felt like never-ending. We began to feel really tired. Each new river crossing stopped being something fun to become a nightmare, one obstacle after another we had to overcome again and again even if we don't want to. At an altitude of 1700 m, and in the first week of September we had -5ºC at night and overcast days were freezing as well, thus crossing the rivers was already a painful experience. We finally reached the immense lake on a cloudy day, entering from its East side, the most remote and the one who see little to no tourists at all. The views were spectacular but not so shocking after having already been through so much overwhelming beauty. With 147 km long, it was just a fraction of it that we were able to see, but the most valuable was the road to get there rather than the destination in itself.